Bovilis Bovipast RSP & IBR Marker vaccines are essential practice on Cork farm. 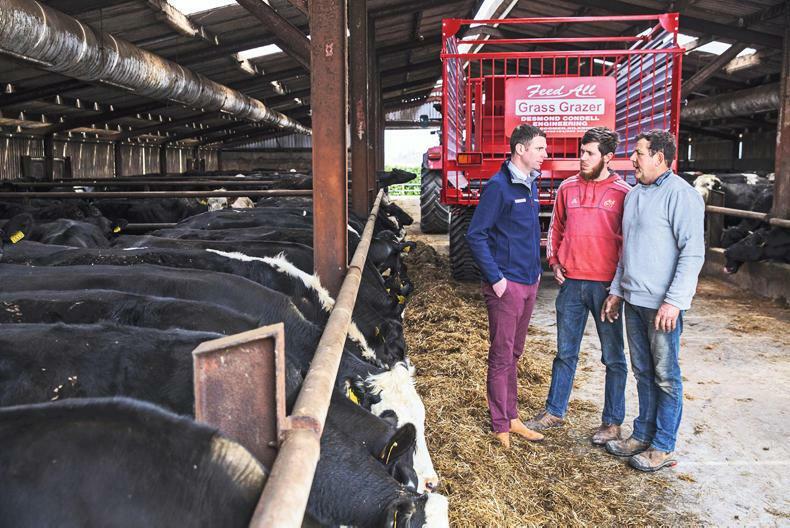 Michael and Don Bourke with Shane Naughton (left) of MSD Animal Health on their farm at Ballyadam, Churchtown, Co Cork. This year has seen the purchase of a new Feed All Grass Grazer. Michael, his wife Ina and son Don finish 1,000 cattle a year on their farm at Ballyadam on the outskirts of the village of Churchtown. “We were using another vaccine to protect against pneumonia. We were getting outbreaks and losing stock. Postmortem exams showed a mixture of pneumonia and IBR. “They get a booster shot of Bovipast RSP four weeks after the first shot,” said Michael. Bovilis Bovipast RSP is a cattle pneumonia vaccine that protects against pasteurella pneumonia (caused by the bacteria Mannheimia haemolytica) as well as two viruses, RSV (Bovine Respiratory Syncytial virus) and PI-3 virus (Parainfluenza 3 virus). Bovilis IBR Marker Live protects against IBR (Infectious Bovine Rhinotracheitis). Almost 75% of dairy and beef herds have been shown to have exposure to IBR. As well as a dramatic reduction in losses, the introduction of the Bovipast RSP/IBR Marker Live vaccination programme has led to a big reduction in the number of animals requiring treatment for respiratory disease. As a result, there is much lower use of antibiotics on the farm. “We have also found that if an animal does get sick, it now responds much better to treatment,” said Michael. The Bourkes also vaccinate with Tribovax 10 to protect against the main clostridial disease strains. “Blackleg, one of these diseases, is a big problem in this area. If we didn’t vaccinate, we would lose animals. “We used to give just one shot of the vaccine when animals arrived on the farm, but we were still losing the occasional animal. “We now give a primary course of two shots four weeks apart, on the same days as we give the primary and booster shots of Bovipast RSP. “Since we’ve given two shots, we have had no problems,” said Michael. Cattle are also treated for worms, fluke and for external parasites. He acknowledges the support of the veterinary practitioners in Buttevant Veterinary Centre in ensuring that all elements of his animal health programme are in line with best practice. The Bourkes finish 1,000 forward stores every year, split half and half between heifers and bullocks. Mainly Angus- and Hereford-crosses, they are bought at 450kg to 550kg. The majority come from Kanturk Mart in north Cork and from Tralee, Casteisland and Gortatlea marts in Kerry. They are fed for between 70 and 100 days. The Angus and lighter Herefords are sold at 320kg carcase weight to Jennings of Ballinrobe for the Dunnes Stores Simply Better range. The remainder are brought up to 380kg carcase weight and are sold to Liffey Meats. All cattle, with the exception of around 20 that are used to mop up headlands around zero-grazing paddocks, are fed indoors. The winter diet consists of baled silage, straw, crimped wheat and barley (they grow their own barley), moist maize distillers grain from the Midleton distillery, ensiled potatoes, rolled maize, soya hulls and molasses. A premix of maize, limestone flour, minerals and yeast is also added. All ingredients are mixed in the diet feeder. They avail of nutrition advice from Michael Cleary of Specialist Nutrition. In a normal year, the Bourkes would be cutting their first paddock with the zero grazer on 12 March. This year, they were well over a month later. Paddocks are cut every 30 to 35 days. This ensures that there is more fibre in the grass. This season has seen the purchase of a new zero grazer. The Feed All Grass Grazer was produced and supplied by Condell Engineering at Castlecomer, Co Kilkenny. “We designed the machine ourselves, in conjunction with the Condell family. I much prefer to deal with a family-owned company,” said Michael. Slurry, which is spread with a trailing shoe, is the primary fertiliser source. There is very little chemical fertiliser used. Paddocks are reseeded every seven years. With the exception of straw, crimp, minerals, limestone flour and yeast, no meals are fed when cattle are on grass. Animals eat 40kg of fresh grass/day. Cattle gain an average of 1.6kg/day during the winter. Performance on grass averages 1.2kg/day. Daily feeding costs on zero grazing are €1.50/animal lower compared with the winter diet.